BEIJING/WASHINGTON – China said on Friday it was “strongly dissatisfied” after a US spy plane flew over part of the South China Sea this week near where China is building artificial islands, and called on the United States to stop such action or risk causing an accident. The US flight on Wednesday was highlighted by the unusual Pentagon decision to invite a CNN team aboard the Poseidon surveillance plane. It said the Chinese navy issued eight warnings to the aircraft to move away from the contested territory. Chinese Foreign Ministry spokesman Hong Lei said the Chinese military drove away the aircraft, in accordance with relevant regulations. He labeled the US action a security threat to China’s islands and reefs. “Such action is likely to cause an accident, it is very irresponsible and dangerous and detrimental to regional peace and stability. We express our strong dissatisfaction, we urge the US to strictly abide by international law and international rules and refrain from taking any risky and provocative actions,” he told a news conference. Colonel Steve Warren said the Poseidon had not gone within 12-mile (19-km) territorial limits that China claims around the artificial islands but said this could happen in the future. The US stance reflects the fact that while it does not recognize Chinese territorial limits around reclaimed land, it wants to avoid escalating the issue further than necessary, he said. Washington has been struggling to find a way to discourage what it has described as the “unprecedented” speed and scale of China’s land reclamation work. He said the US reconnaissance flight was “entirely appropriate” and that US naval forces and military aircraft would “continue to fully exercise” the right to operate in international waters and airspace. The Pentagon believes the work is aimed at cementing China’s claim to the vast majority of the South China Sea – an important international shipping route and an area thought to have significant energy reserves and rich fishing grounds. Washington is particularly concerned that China, whose claims overlap with those of Brunei, Malaysia, the Philippines, Vietnam and Taiwan, may at some point declare an exclusion zone in the sea that could limit free movement of ships and aircraft. 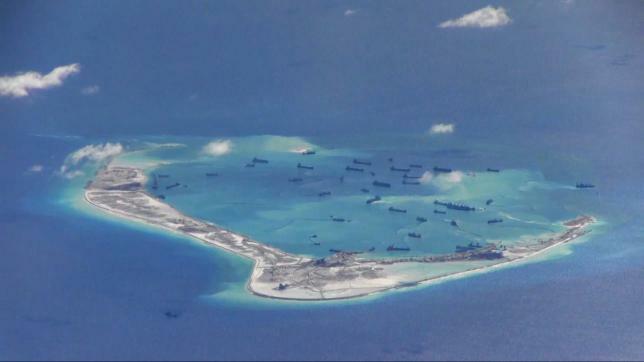 US Deputy Secretary of State Antony Blinken said on Thursday that China’s land reclamation was undermining freedom and stability and risked provoking tension that could lead to conflict. The Global Times, a tabloid owned by the ruling Communist Party’s People’s Daily, called the US flights “provocative”. “Washington is purposefully raising tensions with China, a move that has created a higher risk of a physical confrontation,” it said in an editorial on Friday.